Besides Derek Hough helping Meryl Davis and Charlie White with their choreography for the Olympics, did you know there is another Dancing With The Stars connection? Below is a new interview with for Emmy Award winning and former Dancing With The Stars costume designer Randall Christensen as he designed Meryl and Charlie’s breathtaking Olympic costumes. What’s more, they won a GOLD medal in them!! @LinzeyReed and I were so fascinated to learn more, that we came up with a few questions for him. Below Mr. Christensen tells his riveting story from the heart, how he was inspired, and the details that went into making each costume. 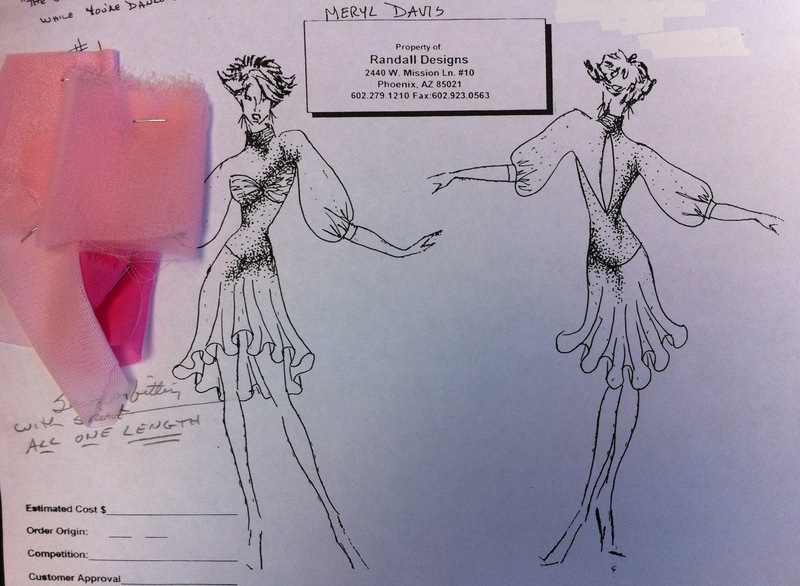 Not only that, he provided us with a sketch with some silk fabric swatches while he was in the designing process of Meryl’s “My Fair Lady” short program costume. He also tells us about his other ventures. Without further ado, below is Randall Christensen and we can’t thank him again for his time. Read on…. Hi Mr. Christensen, how are you? It’s good to be talking with you and seeing you light up twitter with your interest in the Olympics and Figure Skating. From a recent interview we read with ABC15 in Phoenix, AZ, we hear there is a very special reason why as you designed the costumes for several ice skating teams including gold metalists Meryl Davis and Charlie White. Congratulations! Their costumes were absolutely divine and your best work yet. We can’t imagine what you must feel like knowing you had a part in them winning Gold in your stunning designs. I HAVE TO SAY, IT IS BEYOND AN HONOR TO DRESS OUR NEW OLYMPIC CHAMPIONS! I THOUGHT WORKING WITH THE STARS AND DANCERS ON DWTS WAS FULFILLING (WHICH IT WAS), BUT MERYL AND CHARLIE ARE OLYMPIANS! LET ALONE OUR COUNTRY’S HEROES! I WAS THRILLED TO BE ABLE TO CONTRIBUTE TO THEIR OLYMPIC EXPERIENCE. Can you tell us about how and when this union came to be? What was the designing process like and working with Meryl and Charlie for the Olympics? Was Derek Hough involved in any way with the costume process since he choreographed their Short dance? MY COMPANY HAS BEEN WORKING WITH MERYL AND CHARLIE FOR SEVERAL YEARS, WHILE I WAS STILL WORKING ON DWTS. THEY APPROACHED US IN 2009/2010 TO MAKE COSTUMES FOR THEM. WHEN I ENDED MY RUN ON DWTS THEY WERE ALREADY ESTABLISHED CLIENTS. MERYL’S MOTHER CHERYL HAS BEEN A GODSEND AND SUCH A HELP WITH THE DESIGNING PROCESS. SHE (& THEY) SEND US PHOTOS, MAGAZINE PICS AND/OR VIDEOS TO HELP US GET IDEAS OF THINGS THEY’RE CONSIDERING FOR A COSTUME. FOR THIS COMPETITION SEASON WE HAVE ACTUALLY CREATED 3 DIFFERENT PINK COSTUMES FOR MERYL. SHE WORE THE FIRST ONE IN BOSTON, A VERY SIMPLE, CLASSIC COSTUME – SLEEVELESS, WITH LOTS OF CRYSTAL JEWELS ALONG THE NECKLINE AND WAISTLINE. WE CREATED A SECOND (STILL NOT SEEN) PINK COSTUME BASED OFF OF A MAGAZINE “TEAR SHEET” PHOTO. IT WAS A BEAUTIFUL COSTUME JUST ENCRUSTED WITH THOUSANDS OF VARIOUS SIZES AND SHADES OF PINK RHINESTONES. THE THIRD PINK COSTUME (AND THE ONE THAT SHE ENDED UP WEARING FOR THE SHORT PROGRAM IN THE OLYMPICS) DEFINITELY HAD A VINTAGE FEEL TO IT, WHICH WAS INTENTIONAL. THEY WERE DANCING TO “I COULD HAVE DANCED ALL NIGHT” FROM “MY FAIR LADY.” I THOUGHT THAT THE COSTUME EMBODIED THE LOOK OF THAT ERA, THE FEELING OF YOUTH AND INNOCENCE THAT THE CHARACTER (IN THE MOVIE) FELT, AS WELL AS THE FEELING OF HOPE AND OPPORTUNITY THAT SHE WAS EXPERIENCING, FEELING BEAUTIFUL FOR THE VERY FIRST TIME. ALL OF THESE EMOTIONS ALSO WERE MIRRORED IN MERYL! I FELT IT WAS A PERFECT BLENDING OF CHARACTER, EMOTIONS AND EMBODIED HOW MERYL WAS FEELING. HER MOTHER SENT A VIDEO CLIP OF AN OLD MOVIE THAT HAD A SIMILAR IDEA. FOR ABOUT A WEEK I STRUGGLED WITH TRYING TO FIGURE OUT HOW TO MAKE THE COSTUME WORK, AND STILL BE YOUTHFUL AND DREAMY. AFTER SEVERAL (FAILED) ATTEMPTS, I STRUCK GOLD (no pun intended) WITH THE CONCEPT THAT WE WENT WITH. I ABSOLUTELY LOVED THE PINK APPLIQUE WORK THAT WE DID, SCULPTING AND SHAPING AREAS OF MERYL’S BODY, AND THE JEWEL/STONE WORK WAS PHENOMENAL! AFTER WE SENT THE COSTUME FOR A FITTING, MERYL ASKED IF WE COULD TAKE OUT ONE OF THE (3) LAYERS OF SILK CHIFFON IN THE SKIRT AND ADD A DARKER PINK, SO THAT THEIR FINAL LIFT WOULD SHOW THE CONTRASTING UNDERSKIRT. AS FATE WOULD HAVE IT, I WAS IN DOWNTOWN LOS ANGELES FABRIC SHOPPING WHEN MY ASSISTANT IN PHOENIX CALLED AND TOLD ME, SO I WAS ABLE TO GET THE CONTRAST COLOR SILK RIGHT THEN. AND I MUST SAY, THE CONTRASTING UNDERSKIRT DEFINITELY MADE SUCH AN IMPACT! THE LAVENDER COSTUME WAS BASED ON AN IDEA THAT I USED FOR ONE OF THE DANCERS ON DWTS. MERYL AND HER MOM LOVED THAT NECKLINE, AND WE PROCEEDED FROM THERE WITH THE DESIGN. I HEARD (ONE OF THE MOMS SAY) THAT THEY WERE UP ALL NIGHT ADDING MORE STONES AND JEWELS TO THE COSTUME. IT WAS THE PERFECT COSTUME FOR THEIR LONG PROGRAM. THE TEAL COSTUME THAT THEY HAD WORN FOR THE TEAM SKATE WAS NOT OURS, AND I WAS HOPING AND HOPING THAT THEY WOULD GO WITH THE LAVENDER ONE FOR THE LONG PROGRAM, KNOWING THAT THE OLYMPIC PHOTOS AND GOLD MEDAL SHOTS WERE GOING TO BE IN THE LONG PROGRAM COSTUME. I AM THRILLED AND HONORED! Tell us about the other ice skaters you designed for. WE HAVE DESIGNED FOR MANY SKATERS OVER THE YEARS. OUR FIRST BIG TIME ICE SKATERS WERE RENEE ROCA AND GORSHA SUR WAY BACK WHEN……AND HAVE ON OCCASION WORKED WITH SEVERAL OF TODAY’S CURRENT CHAMPIONS AND FINALISTS. WE ALSO CREATED COSTUMES FOR THE ICE DANCERS REPRESENTING LITHUANIA – ISABELLA TOBIAS AND DEIVIDAS STAGNIUNAS. ISABELLA HAS BEEN COMING TO US FOR YEARS. IT WAS BEYOND THRILLING TO WATCH THEM COMPETE, WEARING OUR COSTUMES! SHE HAS SUCH A COMPLETELY DIFFERENT STYLE THAN MERYL AND IS SUCH FUN TO DRESS. I AM ALWAYS EAGER TO SEE THE NEXT IDEA AND CONCEPT THEY HAVE IN MIND. IT DEFINITELY KEEPS ME ON MY TOES! How long from start to finish does it take to create a costume and how many costumes did you have to design for them? How many of the same costume did you have to make in case of damage? EACH COSTUME TAKES DIFFERENT AMOUNTS OF TIME, BASED ON THE COMPLEXITY OF THE DESIGN. TYPICALLY THE ACTUAL CONSTRUCTION AND EMBELLISHING TAKES ABOUT 40 OR SO HOURS, BUT IT’S DIVIDED BETWEEN FITTINGS (SHIPPED TO THEM) SO IT’S TYPICALLY SPREAD OUT OVER SEVERAL WEEKS TO SOMETIMES OVER A MONTH. AND THEN, IF A COACH WANTS SOMETHING CHANGED, WE DO EVERYTHING WE CAN TO ACCOMMODATE THEIR (AND EVERYONE’S) WISHES. Also, working with sheer material and the ornate details of jewels and decorations must be a challenge. What special steps or process is taken? WELL, NOTHING MOVES LIKE SILK! AND NOTHING WRINKLES MORE THAN SILK!! STILL, THE ADDED TIME TO STEAM AND PRESS SILK IS FAR SURPASSED BY THE EFFECT THAT SILK HAS ON THE ICE! IT IS JUST WEIGHTLESS AND FLOWS LIKE NO OTHER FABRIC. IT’S JUST MORE FRAGILE AND QUITE TRICKY TO SEW ON. AND IT SNAGS ON EVERYTHING! STILL, YOU DO WHAT YOU HAVE TO, TO CREATE THE DESIRED EFFECT. AND SILK WILL WIN OUT EVERY SINGLE TIME! WE ARE ALWAYS FACED WITH THE CHALLENGE (ESPECIALLY WITH THIS PINK COSTUME) TO FIND MATCHING SILK CHIFFON, LYCRA AND MESH – ALL IN THE SAME FAMILY OF SHADE(S). THE APPLIQUE LACE WAS CUSTOM DYED (BY ME) AND THEN DIFFERENT COLORS OF CRYSTALS WERE ADDED TO ENHANCE AND GIVE DEPTH TO THE COLORS. From all the costumes you designed for the Olympics, which is your very favorite and why? YOU KNOW, SO MUCH OF ME GOES INTO EACH COSTUME, TRYING TO CAPTURE THE ESSENCE OF WHAT IS DESIRED (AS WELL AS EMPOWERING THE WEARER) THAT I HAVE TO SAY THE EVERY SINGLE COSTUME IS MY FAVORITE, BECAUSE IT IS SUITING THE INTENTION BEHIND THE CONCEPT. THE PINK COSTUME CAPTURED THE ESSENCE OF A YOUNG WOMAN FEELING BEAUTIFUL, GLAMOROUS AND CONFIDENT (JUST LIKE MERYL!). IT IS A VINTAGE LOOK, FOR A VINTAGE SONG ABOUT THE HOPES AND DREAMS OF A YOUNG WOMAN – AGAIN, MIRRORING (I FEEL) THE EMOTIONAL JOURNEY OF MERYL. SO I GUESS THAT DRESS HAS A SPECIAL PLACE IN MY HEART, AS THE OLYMPICS IS SUCH A PINNACLE TO ASPIRE TO, AND THIS DRESS EMBODIES THOSE EMOTIONS. Lastly, do you have more projects and designing in the works that we should watch out for? LOTS OF DANCERS LIKE OUR READY TO WEAR TO REHEARSE IN, AND OTHERS USE IT FOR COMPETITIVE DANCE WEAR. WE ARE ALSO REVAMPING OUR LINE OF LADIES’ READY TO WEAR, SO WATCH FOR IT! THERE’S ALWAYS ANOTHER PAGENT, SKATING EVENT OR BALLROOM COMPETITION AND WE ARE ALWAYS REPLENISHING OUR RACK OF READY MADE WOMEN’S COSTUMES (IT’S NOT ALL CUSTOM DESIGNED – WE HAVE A MARKET FOR BOTH, ACTUALLY), WHICH IS ALWAY NEEDED, DUE TO OUR CLIENTS PURCHASING OFF THE RACK. THANK YOU! I HAVE TO SAY, WORKING ON DWTS WAS A HIGHLIGHT OF MY PROFESSIONAL CAREER. WORKING WITH MERYL AND CHARLIE HAS TO BE THE HIGHLIGHT OF MY LIFE! TO DRESS OLYMPIC CHAMPIONS……DOES IT GET BETTER THAN THIS?!?? 13 responses to "PureDWTS Exclusive: Designer Randall Christensen Talks Of How He Designed Meryl Davis & Charlie White’s Olympic Costumes & More"
It’s amazing to think of all that goes into designing these costumes. He took into consideration the song, its’ era and the whole meaning behind the movie. Also, fun to hear how much the Moms are involved with the whole process. I love the fact that Meryl wanted a deeper tone to the underskirt. I did notice that on that lovely pink dress and thought it added a different dimension. Perfect! Wish someone would do a documentary on how these beautiful costumes are made from start to finish; and show the added precautions to avoid a wardrobe malfunction. I’m sure a lot was learned designing for DWTS. Interesting insight. This costuming wasn’t my favorite work of Randall’s but oh how I miss his style on DWTS. Hasn’t been the same since he left. Well said Linz! Thanks again for your help with this interview! What a good idea to have a documentary on this too. I agree about the costuming of DWTS—every once in a while there is a stand-out piece but every one of RC’s was exquisite. I really miss that wow aspect (= several others things !) from past seasons. But Congratulations RC, on your part in Meryl and Charlies historic win. Just like being able to see Derek Hough’s “hand” in the choreo, your designs also always stand out above the rest ! sorry typo!! meant- AND -several other things !! What a great interview. That attention to detail is why I always enjoyed Randall’s work on DWTS and why I still miss it. Meryl looked exquisite during she and Charlie’s performances. THANKS SO MUCH for this WONDERFUL INTERVIEW with Randall!!! Being a long time DWTS fan … and an amateur seamstress/quilter … I loved the peek into his creative process. Could Meryl have looked any more beautiful than she did in the lavender ‘Scheherazade’ costume … or wearing Randall’s frothy, pink creation for the ‘My Fair Lady’ number. I think not!!! Congratulations to Randall for his spectacular work … miss you very much on DWTS!!!! Thanks again for this great interview … LOVE the website!!!! Both of the dresses were beautiful. The SD absolutely flowed & sparkled, and I loved addition of the darker underskirt. The lilac dress really complimented Charlie’s shirt without being matchy-matchy. They were perfect. Oh, and if the third dress is the darker pink worn in practice, I really hope to see that one worn at Worlds. I miss Randall’s work on DWTS. My favorite costume of all time on DWTS is a Randall Christensen design. It’s the peacock feather dress Lacey wore for her Waltz with Steve O.
I would even go on Randall’s website to admire the costume. You could actually purchase some of the DWTS costumes he designed and I often wished I had the money to own it. I have no idea where I would wear it and it would be too small for me anyway. Perhaps I could just hang it on mannequin and just admire it! lol! Didn’t I read/hear that Meryl and Charlie were retiring after this?? @Princess Heidi- Canada’s pair are definitely retiring after this. Meryl & Charlie apparently haven’t decided yet whether they are going to end after the Olympics, Worlds, or keep going (according to a SI article). Yes, I believe Meryl and Charlie are retiring from Olympic competition. They will go on the ice show circuit I’m sure, they have already done Stars on Ice. They have college at University of Michigan to finish, tons of endorsement deals. I am sure they will be on the TV ice skating specials. They have very busy lives coming up. But, boy, I hope they are already in the Season 18 cast. They could very well be. Probably not, but I would love them to be! It would be so cool for them to compete opposite each other. They would love to be on. Or just make a dancing appearance on the show. I loved reading this interview too. I had seen similar pieces over my years of loving skating as to how costumes are thought out and made.